First up is this drapey t-shirt dress from J.Crew Factory. 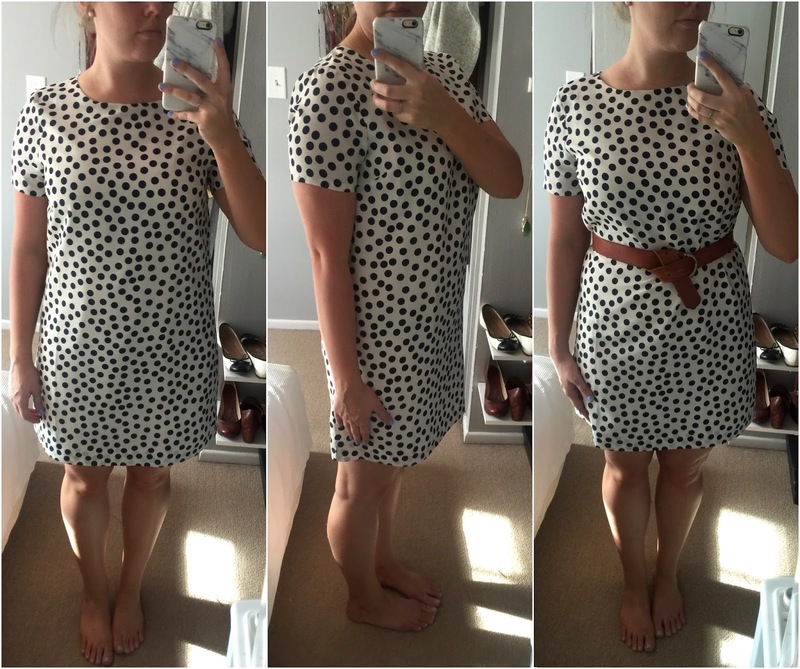 When I first discovered this dress two months ago, almost all sizes were sold out, but eventually a size 10 popped back, and although the reviews said to size up, I ordered it anyway. 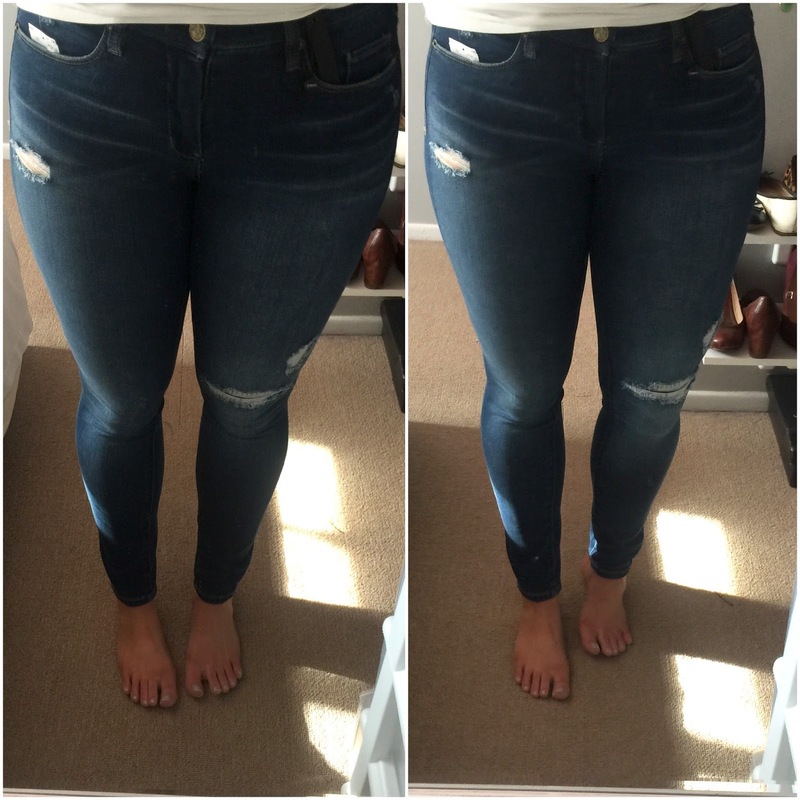 I now agree with the reviews - that size 10 was way too short and tight on me! That dress was immediately returned, and I continued to watch the site waiting for a size 12 to pop back, and luckily it did! So this is a polyblend t-shirt style dress. It has a slip underneath, which makes it opaque (love when they do that!). The fabric is just a bit crinkly, I wish it had a bit of cotton in it, but that's not a big deal (just wanted to give you a heads up!). 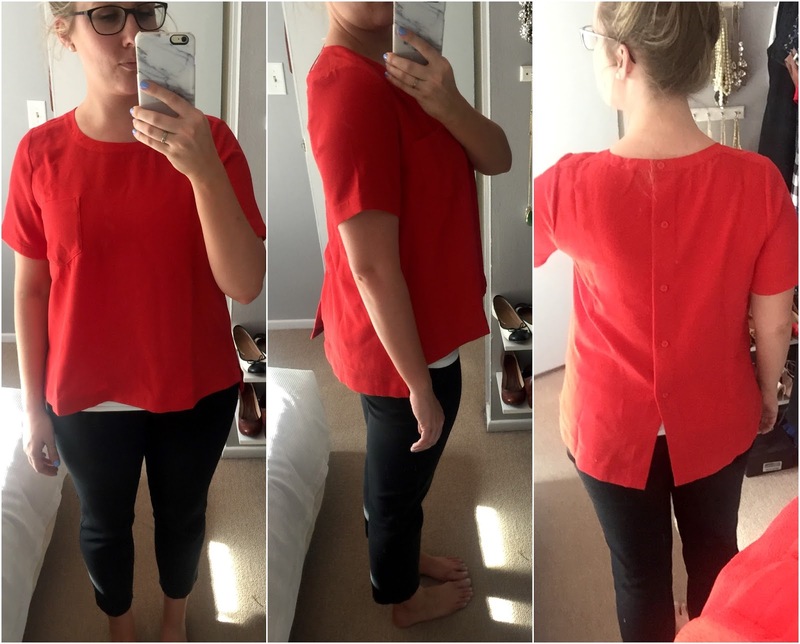 As far as the fit goes, I find it just a tiny bit too loose in the waist (which isn't always a bad things - I need room for brunch!). It's quite shorter than what I typically wear though, as I like dresses to go right above my knees, and this is about an inch below my finger tips (as you can see in the middle picture). This is one of those situations where a tall option would have been great! I typically try to buy clothes I can wear both in my professional and my personal life, but you know, sometimes you just have to keep the fun dress and wear it on the weekends, even if it's just a bit shorter than you would normally wear. The dress is currently 50% off, plus if you use the code SRSLYSPRING, you can get free shipping too! Next up is Madewell's eyelet tee. I mentioned this a few weeks ago, and while I was considering ordering it in navy instead of my go-to white, I just knew I would love the white more. I ordered this in a size large. 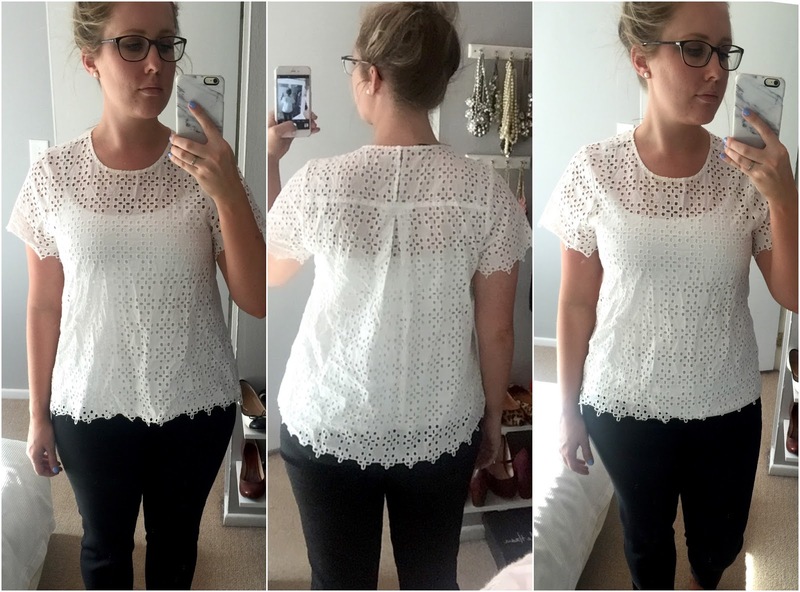 This peekaboo lace is so freaking pretty! As you can see, it does require wearing a cami underneath (I'm wearing my favorite from Express), unless you're super daring and much cooler than I am. As most things at Madewell, this top is just a bit boxier than I generally prefer, but luckily that has an easy fix! In the back, you can see that is gathered near the top. My plan is to put in a few stitches down the back, to about the level of my waist, to bring it in just a little bit. This will give me the definition I prefer while keeping the general look of the shirt. I clipped in the picture on the right, so you can see that it's just a bit less boxy than before. Again, I would have loved if this was about two inches longer in front, but that's something I'm more than willing to ignore for such a pretty blouse. The other item from that Madewell order was this button-back top. I feel in love with this shirt on Nicole, but it just does not look as good on me as it does on her. Again I'm wearing a large here. I find that it falls at a weird point on me - right at my widest point, and with its boxier shape, it really makes me look much bigger than I am. If this had been about three inches longer in the front, I would have loved this shirt. It's actually a very well made (Madewell? har har) shirt, with a heaver fabric and great details. It just didn't work on me, unfortunately. The last item is one I'm torn on. This is the Hotel Distressed skinny jeans from BlankNYC. Here are the things I love about them: they are so soft (must be the 97% cotton/3% spandex combo), the distressing is just the right amount, the length is great (31 inch inseam), and the price isn't horrible. The two things I wish I could change would be to make them just a little bit darker, and to get rid of the whiskering (why is this still a thing?!). I'm honestly considering buying a darker blue fabric marker and coloring it in, just to cover those up a bit (I've never done that, but I'm willing to try!). So I'm like 90% in love with them, and while I typically say don't keep it unless you 100% love it, maybe that's a bit extreme for a pair of distressed jeans? Like, if you find something that is pretty darn close to what you've been looking for, just be happy? Thoughts? (side note, the reviews did mention to size down, which I did, so if you are interested, I'd also advise going down a size! ).